With some 800,000 people killed in 100 days, the 1994 Rwandan genocide was one of the bloodiest events of the 20th century. Twenty-two years later, the incident that sparked the mass slaughter—the shooting down of a plane carrying the then president of Rwanda, Juvénal Habyarimana—remains a mystery, with opposing sides trading accusations of liability. France’s role in the massacre has long been scrutinized—the country has repeatedly dismissed accusations that it trained militias from the majority Hutu ethnicity to take part in the massacres, which were directed against people from the Tutsi minority and moderate Hutus. Now, much to the chagrin of Rwandan President Paul Kagame, France is reopening an investigation into the assassination of Habyarimana. Kagame has warned of a “showdown” with France, including the prospect of freezing diplomatic relations. Here, Newsweek reviews the events that led to the mass killings and the role France played during and after the genocide. How Was Former Rwandan President Juvenal Habyarimana Assassinated? On the night of April 6, 1994, Habyarimana was flying back to the Rwandan capital of Kigali, following a summit in Tanzania. Also on board was the then president of Burundi, Cyprien Ntaryamira, along with seven other Rwandan and Burundian officials and a three-man French crew. As the plane circled before landing in Kigali, it was struck by two surface-to-air missiles, bursting into flames mid-air before crashing into the garden of the presidential palace and exploding on impact. Everyone onboard was killed. 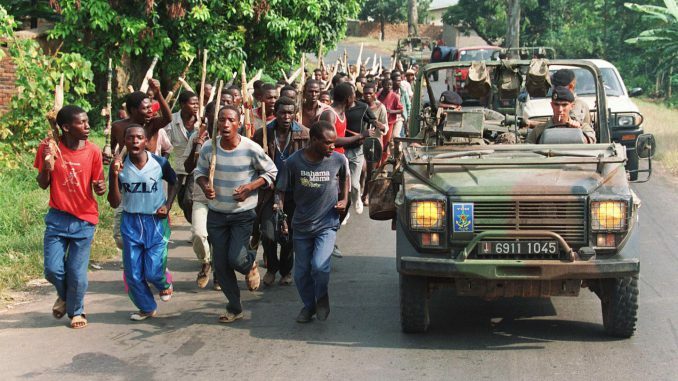 What Happened After Habyarimana’s Assassination? Rwanda was already in the middle of a civil conflict that was cast along ethnic lines. Rwanda has a Hutu majority of around 85 percent; the remaining 15 percent of the population are largely Tutsi. Habyarimana was a Hutu and the country’s government at the time was dominated by the majority ethnic group. The Rwandan Patriotic Front (RPF), a rebel organization led by the minority Tutsis, was fighting a guerilla war for power that had led to the creation of Hutu extremist militias determined to resist the RPF. Within hours of Habyarimana’s assassination, Hutu militias and government troops began systematically killing Tutsis and moderate Hutus throughout the country. The killing went on for 100 days, claiming the lives of an estimated 1 in 10 Rwandans, before the RPF seized control of Kigali and declared a ceasefire. Who Shot Down Habyarimana’s Plane? This remains a mystery. Hutu militias immediately pointed the finger at the RPF, of which Kagame was a senior commander. Kagame, however, has maintained that Habyarimana’s murder was the work of Hutu extremists trying to prevent the then Rwandan president from signing a peace agreement with the RPF, and to provide a pretext for the murder of hundreds of thousands of Tutsis. Why Has France Reopened an Investigation? France is responding to claims made by Faustin Kayumba Nyamwasa, a founding member of the RPF and Kagame’s former army chief, who is now living in exile in South Africa. In a written deposition submitted to French magistrates earlier in 2016, Nyamwasa claimed that, on the night of Habyarimana’s assassination, Kagame told him and other officials that the murder had been carried out by members of the RPF. In the deposition, Nyamwasa claimed that Kagame said the missiles had been smuggled into Kigali with a load of firewood and that the mission had been kept secret to avoid any leakage. France began its original probe in 1998 following a complaint from the families of the French crew members who died when the plane was shot down. The inquiry reached several dead ends due to problems evaluating evidence and summoning suspects. In 2006, a French judge issued arrest warrants for nine high-ranking Rwandan officials close to Kagame on suspicion of plotting Habyarimana’s assassination. The move prompted Kagame to break off diplomatic ties with France, though they were later resumed in 2009. How Has Rwanda Reacted To France’s Decision? The latter comment references previous accusations Kagame has made against France of abetting the genocide by training and arming the Hutu militias responsible for the killings. In a 2014 interview with French weekly Jeune Afrique, Kagame said that both France and Belgium, Rwanda’s former colonizer, had played a “direct role” in the “political preparation for the genocide.” France has long denied this accusation: a French parliamentary commission reported in 1998 that, while France’s eventual intervention via a U.N.-mandated operation came too late, the country had not participated in the genocide in any way and had actually taken a leading role in the international community’s response. During the first visit by a French president to Rwanda since the genocide in 2010, then-French leader Nicolas Sarkozy admitted that France made “mistakes” and was afflicted by “a sort of blindness” in its response to the genocide, but stopped short of making a full apology. French authorities have requested the cooperation of South Africa—where Nyamwasa currently lives in a secret location—in formally questioning the former army chief. Nyamwasa, who was indicted by France in 2006 and has also been sentenced to 24 years in jail by a Rwandan court, was the subject of a failed assassination attempt in 2010 in South Africa, which his wife claimed was ordered by the Rwandan government. The Rwandan government denied that charge. Should France pursue the investigation, Kagame could potentially cut off diplomatic relations for the second time. Kagame’s combative language indicates he will not take French interference in Rwandan affairs lying down. “If starting all over again is a showdown, we will have a showdown, there is no problem about that,” he said.